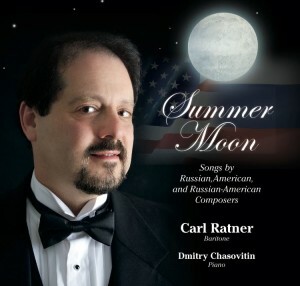 In 2012-2013, Ratner was the featured soloist in a concert honoring the Russian Ambassador to the United States as part of a “Russia Day” celebration in Chicago. He returned to Naples, Florida, to perform the role of Pilate in Bach’s Saint John Passion, as well as the Bass solos in Cantatas 78 and 106 with The Bach Ensemble of Naples. 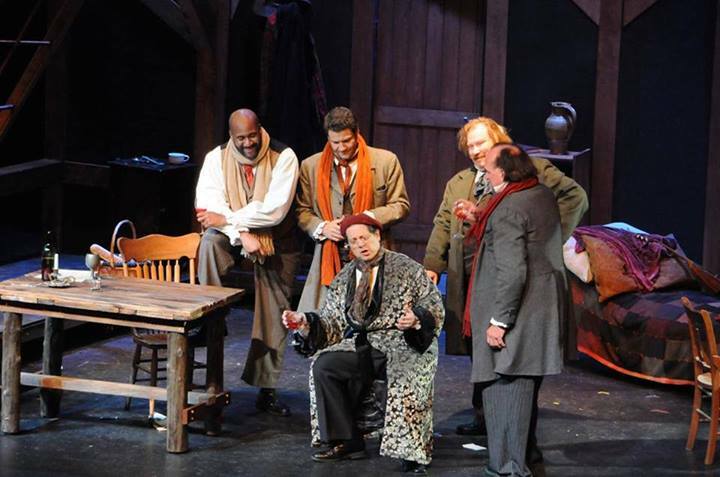 He performed the cycle American Pierrot: A Langston Hughes Songbook, written for him by eminent composer Robert Patterson, at the Belvedere Chamber Music Festival in Memphis, Tennessee, having given the world premiere of the cycle at Western Michigan University the previous year. He directed Pagliacci for Opera at the Acorn in Three Oaks, Michigan and sang the bass solo in Beethoven’s Ninth Symphony with BeethovenFest in Kalamazoo and Messiah with the Kalamazoo Oratorio Society. 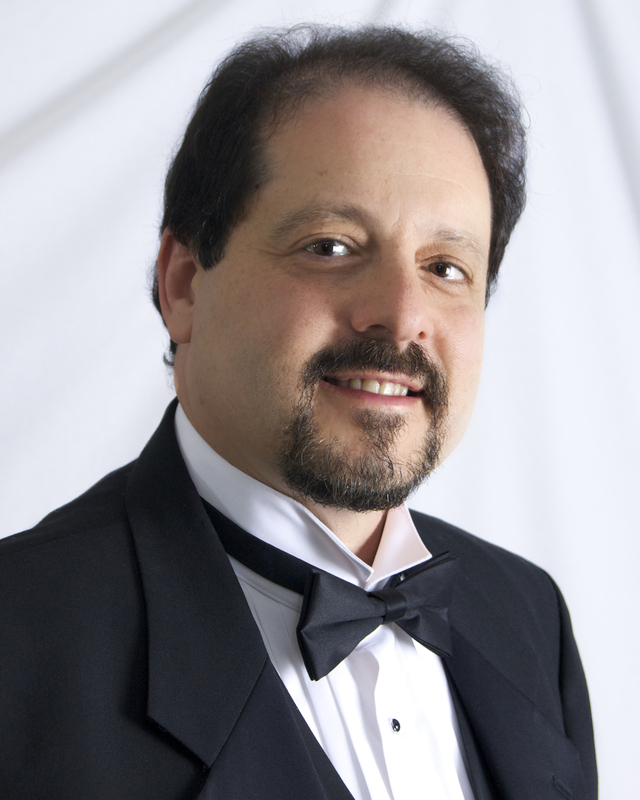 In 2011-2012, Baritone Carl Ratner performed the role of the Marquis in La Traviata with the Kalamazoo Symphony Orchestra, Marullo in Rigoletto for Opera at the Acorn, and the Captain in Eugene Onegin with Opera Naples and the Naples Philharmonic. He sang a program Shostakovich songs at the Russian Cultural Center in Washington DC, and gave recitals in St. Paul, Ft. Myers, and Kalamazoo. He gave master classes at Florida Gulf Coast University, Wheaton College, Chamber Opera Chicago, and at Perugia Summer Music in Italy. 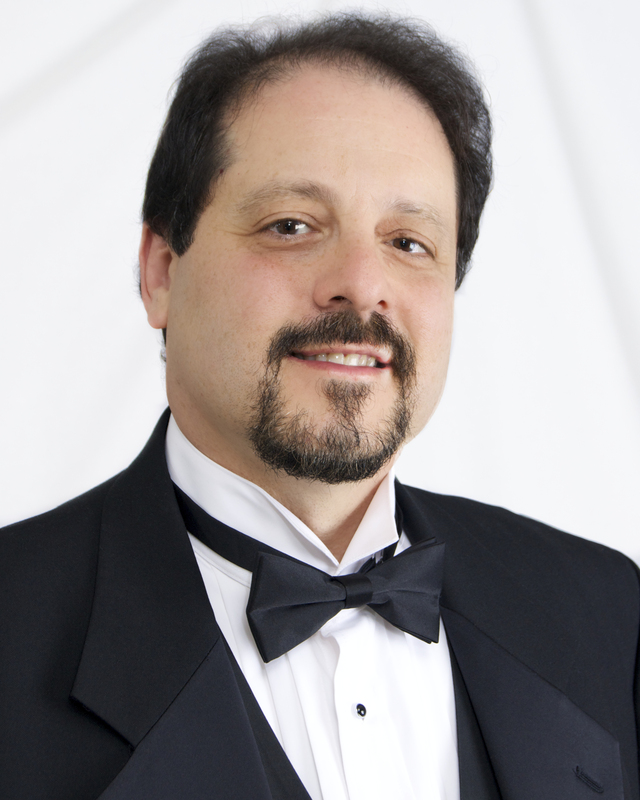 He was baritone soloist for the Mass in B-minor with The Bach Ensemble of Naples, Florida. 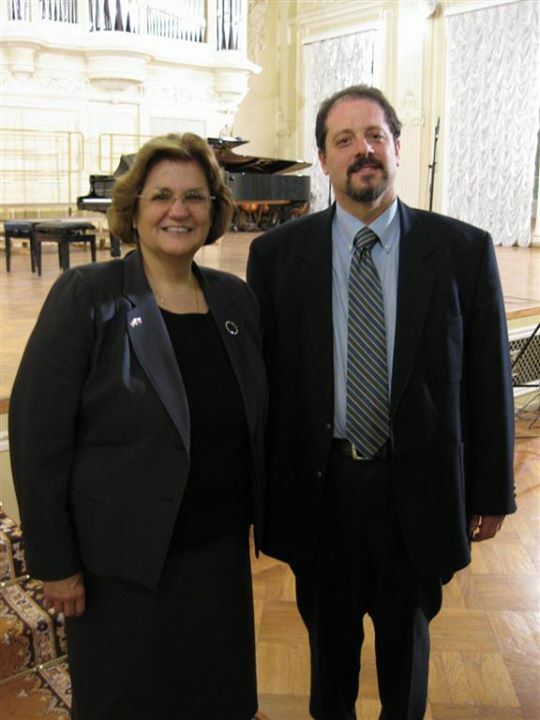 Ratner was awarded a 2010-2011 Fulbright grant to perform in recital, give lectures and master classes, direct an American chamber opera, and research Russian art song at the St. Petersburg Conservatory in the Russian Federation. 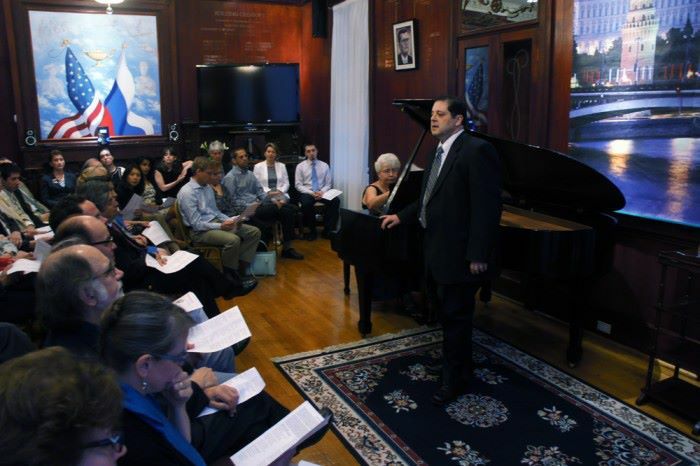 Upon his return, he toured the United States with a recital of Russian and American songs, including a performance at the Chicago Cultural Center as part of “The Soviet Arts Experience,” a multi-event collaboration organized by the University of Chicago. In 2011 he also returned to the Bach Ensemble of Naples Florida for a mixed program of sacred music as well as two performances of Messiah. Other recent engagements include the role of Ping in Puccini’s Turandot with the Kalamazoo Symphony and Sharpless in the same composer’s Madama Butterfly, which he also directed, with the Battle Creek Symphony. 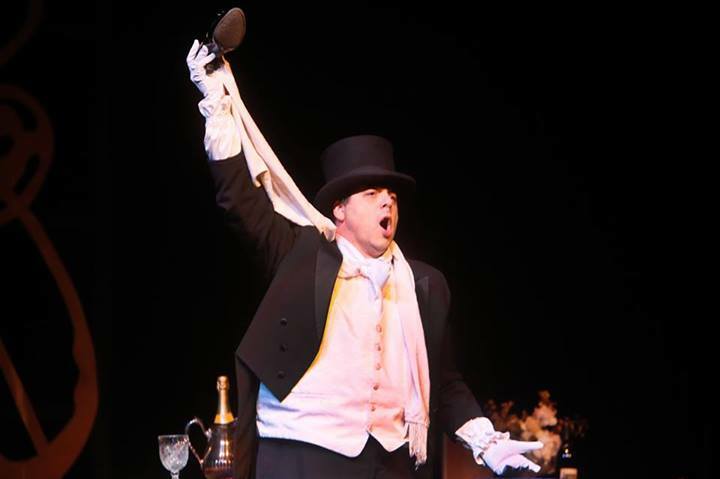 Other operatic roles include Papageno in The Magic Flute, John Proctor in The Crucible, Ford in The Merry Wives of Windsor, and the title roles in Verdi’s Falstaff and Puccini’s Gianni Schicchi. 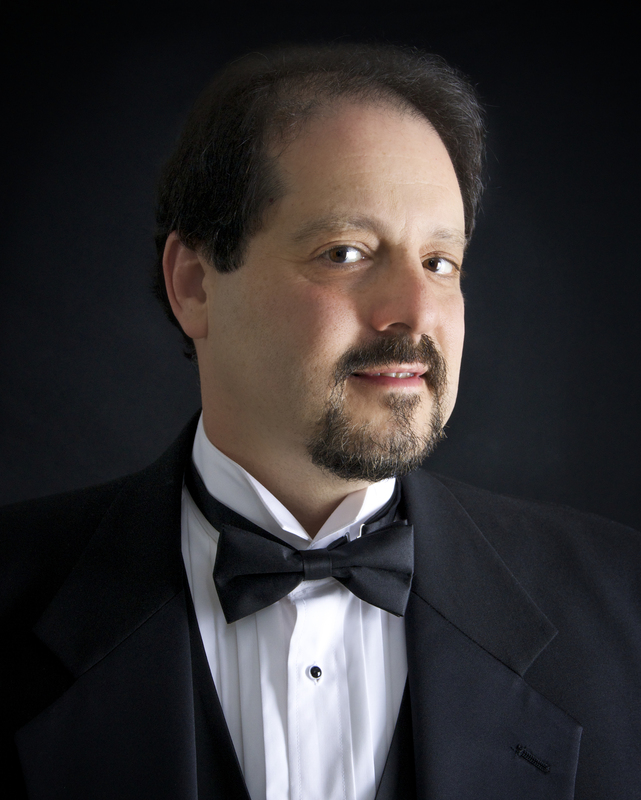 His concert work includes Bach’s Magnificat and Mass in A major with The Bach Ensemble of Naples, Vaughan Williams’s Dona Nobis Pacem and Copland’s Old American Songs with the Cedar Rapids Concert Chorale, and performances of the Fauré Requiem, Orff’s Carmina Burana, and David Gillingham’s Lifesongs. 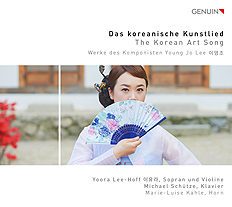 His recital programs, remarkable for their breadth and creativity, have included works ranging from Rameau’s Thétis to Bolcom’s Cabaret Songs. He has performed in 13 languages. 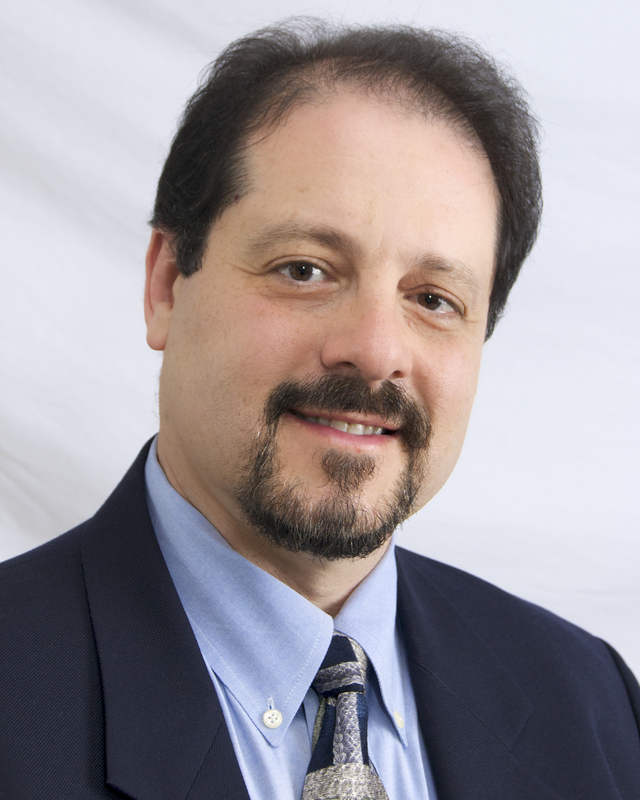 Ratner’s career also includes over two decades of experience as an opera director. He learned his craft assisting directors at major opera houses including Covent Garden (London), the Metropolitan Opera, Munich Opera, San Francisco Opera, English National Opera, New York City Opera, Lyric Opera of Chicago, Santa Fe Opera, and the Spoleto Festival in Italy, where he worked with eminent composer Gian Carlo Menotti. From 1994 to 1999 served as Artistic Director of Chicago Opera Theater, Chicago’s second largest opera company. He previously held the same position with Chamber Opera Chicago from 1984 to 1993. 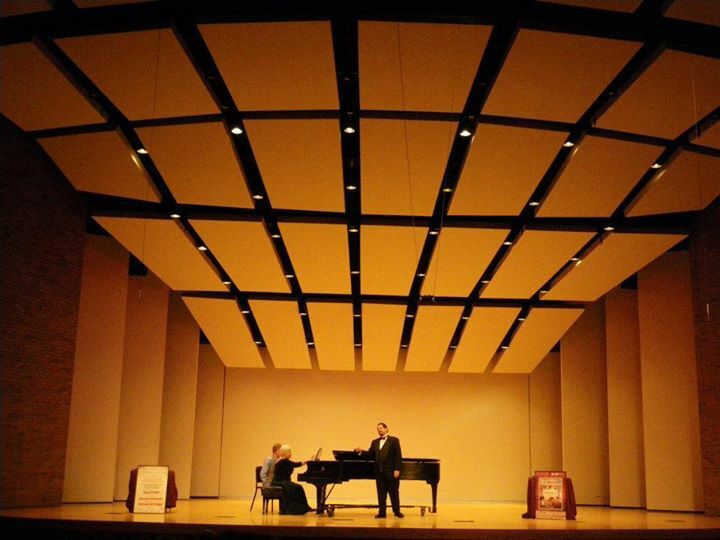 He currently serves as Director of Opera and Associate Professor of Voice for the School of Music at Western Michigan University, where he directs the annual opera production and teaches applied voice, opera workshop, vocal literature, and French and German diction. He received his Bachelor of Music degree in music history from the Oberlin Conservatory in Ohio and also participated in an internship in opera, dance, and drama production at The Juilliard School in New York City. He earned a Master of Arts in vocal pedagogy at Northeastern Illinois University in Chicago and his Doctor of Music degree in Vocal Performance from the School of Music at Northwestern University. Carl J. Ratner’s career includes over two decades of experience as an opera director. He learned his craft assisting directors at major opera houses including Covent Garden, the Metropolitan Opera, Munich Opera, San Francisco Opera, English National Opera, New York City Opera, Lyric Opera of Chicago, Santa Fe Opera, and the Spoleto Festival in Italy, where he worked with eminent composer Gian Carlo Menotti. In 2010, he returned to Opera Naples to direct The Magic Flute, conducted by Lucy Arner of the Metropolitan Opera. He has previously directed Rigoletto, Madama Butterfly, L’enfant prodigue, and Amahl and the Night Visitors for the company. 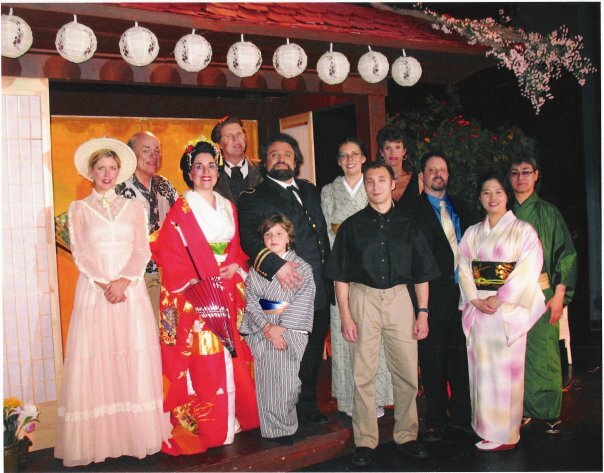 In 2009, he served as resident opera director for the Bay View Music Festival, staging a critically acclaimed production of The Marriage of Figaro. 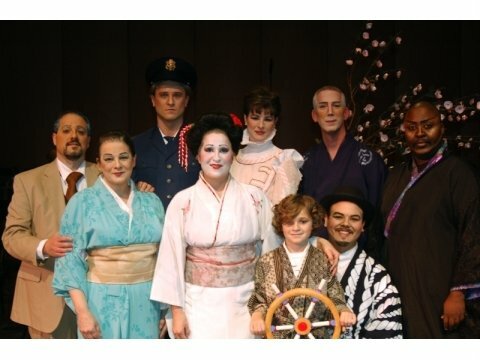 His much-admired staging of Madama Butterfly has been presented by Cedar Rapids Opera Opera Theatre, the Battle Creek Symphony, Opera at the Acorn in Three Oaks Michigan, and Bellissima Opera as well as Opera Naples. 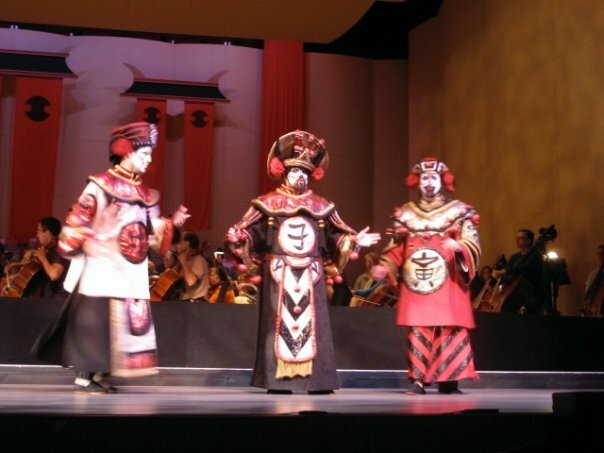 “Kalamazoo Symphony Orchestra’s ‘Turandot’ was thrilling. Soloists ranged from good to superb. Carl Ratner (Ping), David Wahrmund (Pang) and Peter Tantsits (Pong) sang and acted exceptionally well. Barber Song: Sure on this Shining Night American Recital Repertory London Recital, et al. Beethoven An die Ferne Geliebte Complete Cycle German Recital Repertory Bay View Festival, et al. Berlin Miss Liberty Give Me Your Tired American Recital Repertory Saint Petersburg Conservatory of Music, et al. Berlin Song: I Love a Piano American Recital Repertory Saint Petersburg Conservatory of Music, et al. Bernstein Candide: Easily Assimilated American Opera and Musical Theater Cleveland Medical Association Recital, et al. Bolcom Cabaret Songs: George, Over the Piano, Black Max American Recital Repertory Jewel Box Series, et al. Copland Early American Songs I Bought Me a Cat American Recital Repertory Saint Petersburg Conservatory of Music, et al. Gershwin Song: By Strauss American Recital Repertory Saint Petersburg Conservatory of Music, et al. Gershwin Songs: Love Walked In, Love is Here to Stay American Recital Repertory Saint Petersburg Conservatory of Music, et al. Gorney Song: Brother, Can You Spare a Dime American Recital Repertory Saint Petersburg Conservatory of Music, et al. Haydn Creation Adam and Eve Duet English Oratorio and Sacred Northwestern University, et al. 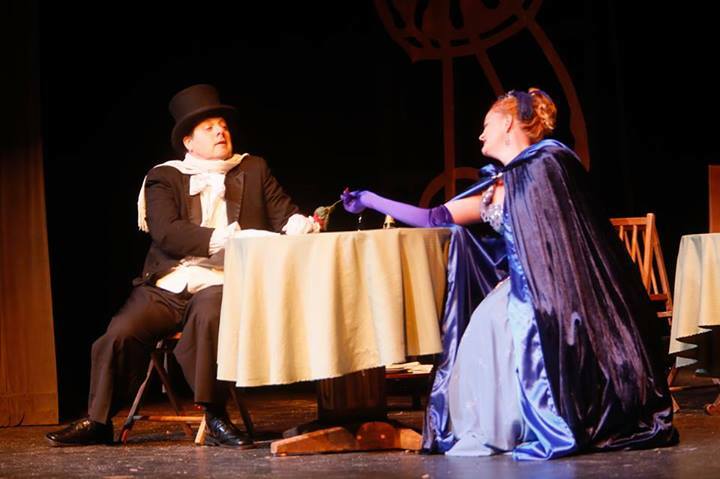 Mozart Zauberflöte Papageno--complete role English Opera and Musical Theater DuPage Opera Theatre, et al. Patterson American Pierrot: A Langston Hughes Songbook American Recital Repertory Belvedere Chamber Music Festival (Memphis) et al. Rachmaninoff Aleko Aleko: Cavatina Russian Opera and Musical Theater Russian Seasons of Minnesota, et al. Rachmaninoff Songs: I Was With Her, God Took Everything Russian Recital Repertory Naples Opera Society, et al. Rachmaninoff Songs: In the Silence of the Secret Night Russian Recital Repertory Saint Petersburg Conservatory of Music et al. Rachmaninoff Songs: Lovely Maiden, do not Sing Russian Recital Repertory Saint Petersburg Conservatory of Music et al. Rodgers Carousel If I Loved You American Opera and Musical Theater Western Michigan University, et al. Rorem Song: Early in the Morning American Recital Repertory London Recital, et al. Schubert Song: Erlkönig German Recital Repertory Never performed--never had a pianist who would play it! Stravinsky Song: Summer Moon American Recital Repertory Saint Petersburg Conservatory of Music, et al. Tchaikovsky Songs, Op. 38: 1. 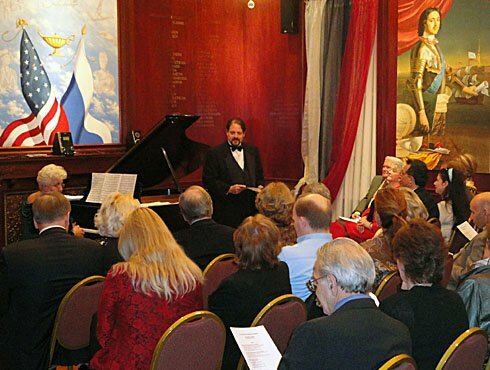 Don Juan Serenade Russian Recital Repertory Saint Petersburg Conservatory of Music, et al. Tchaikovsky Songs, Op. 38: 2. It Happened in Early Spring Russian Recital Repertory Saint Petersburg Conservatory of Music, et al. Tchaikovsky Songs, Op. 38: 3. At a Ball Russian Recital Repertory Saint Petersburg Conservatory of Music, et al. Tchaikovsky Songs, Op. 38: 4. 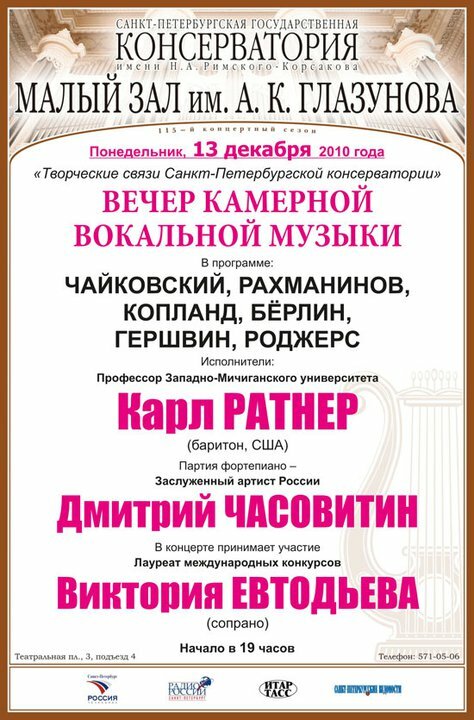 O If Only You Could Russian Recital Repertory Saint Petersburg Conservatory of Music, et al. Tchaikovsky Songs, Op. 6 6. Only the Lonely Heart Russian Recital Repertory Saint Petersburg Conservatory of Music, et al. Verdi Traviata Germont: Di Provenza Italian Opera and Musical Theater Grand Rapids Vocal Music Workshop, et al. Willson Music Man Seventy-Six Trombones American Recital Repertory London Recital, et al. Listen to Russian language expert linguist Carl Ratner discuss Russian Palatalized soft Consonants for American Singers. Listen to Russian language expert linguist Carl Ratner discuss Russian Vowels for American Singers.